Yes, ladies, those fumes are toxic, so think twice before changing your polish several times a week. Plus, a warning about your polish remover from Michael F. Roizen, M.D. 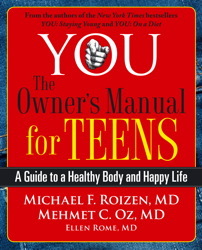 and Mehmet C. Oz, M.D., authors of YOU: The Owner’s Manual for Teens: A Guide to a Healthy Body and Happy Life. Nail polish is likely the most toxic cosmetic there is. Polish includes poisonous substances such as formaldehyde, phthalates, acetone, toluene, and benzophenones. Phthalates, solvents for colors, are toxic to the nervous system; acetone and toluene, which keep the color in liquid form, evaporate quickly and fill the air with noxious fumes, putting your respiratory system at risk. The other substance we fingered, benzophenones, may cause cancer. If you apply polish in adequately ventilated rooms, it’s probably okay, but surely you shouldn’t be changing your polish several times a week, as some teens are known to do. Also, don’t use nail polish remover more than twice a month. Instead touch up the polish. When you do need a remover, avoid those containing acetone, which dries nails and is seriously bad for you. We know you’ll roll your eyes, but acetone is so toxic to your eyes, nerves, and lungs that it’s a good idea to go to the Home Depot and find one of those air filters that will protect your lungs and brain if you use it. Repair splits or tears with nail glue or clear polish. A few years ago, we wrote YOU: The Owner’s Manual, which taught people about the inner workings of their bodies—and how to keep them running strong. But you know what? There’s a big difference between an adult’s body and your body, between adults’ health mysteries and your health mysteries, between their questions and your questions. So, teens, this book is for YOU.